The first sentence is incomplete. You may or may not want to leave it that way, depending on the desired effect. The second sentence needs a comma after grew. I recommend changing was creeping to crept, both because it’s less likely to make idjits who don’t know a damn thing about actual grammar shout, “Passive voice! Baaaaaaad!” at you and because it makes the verb forms in the sentence match more closely. Add a comma after calming. 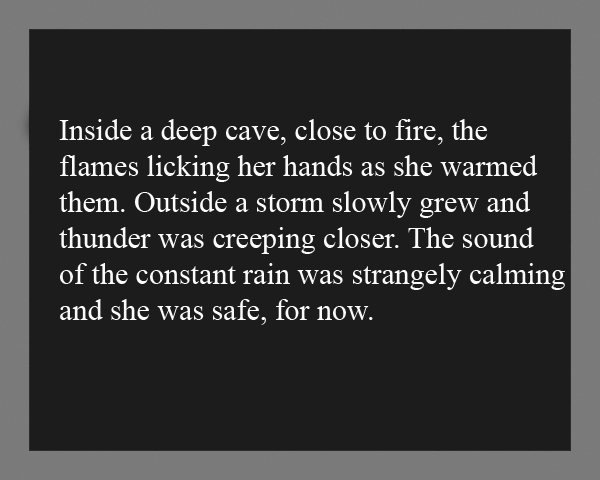 Inside a deep cave, close to fire, the flames licking her hands as she warmed them. Outside a storm slowly grew, and thunder crept closer. The sound of the constant rain was strangely calming, and she was safe… for now. If you don’t want an incomplete sentence at the beginning, try this: Inside a deep cave, she sat close to a fire, the flames licking her hands as she warmed them.